Virginia-based Leesa Sleep is relatively new to the US mattress industry. Founded in 2014, it remains primarily an e-commerce venture; although the company opened its first physical retail store, the Leesa Dream Gallery in Manhattan, in 2016. 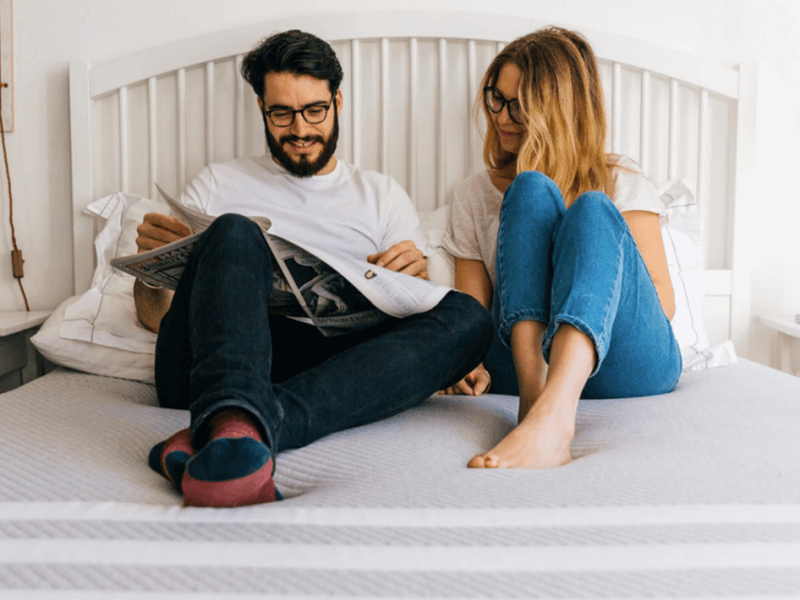 Unlike many traditional brands with multiple product lines for customers with different needs and preferences, this mattress-in-a-box business model keeps it simple. The US-made Leesa mattress, with its well-promoted “universal adaptive feel”, is the flagship product. The only other mattress the company sells is the luxury hybrid Leesa Sapira. In terms of construction, the Leesa mattress is straight to the point; basic, but with a touch of innovation and flair. Here’s how it’s made: three layers of different types of foam are stacked; encased in a snug, fire retardant sock; and then wrapped in a non-removable mattress cover featuring the Leesa four-strip design. Although all the main elements are the same general material, the Leesa mattress is technically a hybrid mattress, because each foam layer is of differing but complementing properties. All elements are proudly made in the United States—even the box the mattress comes in. The two-inch thick top layer of Avena foam is Leesa’s nod to innovation. It is breathable, hypoallergenic and eco-friendly—similar to natural latex foam, but more durable. Apart from being naturally fire retardant and fully recyclable, the patented and trademarked material provides great support without resorting to the use of ozone depleting substances. Leesa also cuts the bottom side of this layer in a ridged pattern; which allows for increased airflow within the mattress, and a comfortable and cooling feel on top. Next is the two-inch memory foam center layer. The memory foam placement takes advantage of the material’s famous positive qualities—contour, deep compression support and pressure relief—without running the risk of encountering the negatives. The Leesa mattress handles heat very well, and while there’s a faint hug-like feel, the body doesn’t sink too deep. Finally, there is the six-inch foundational layer made out of high density support foam. 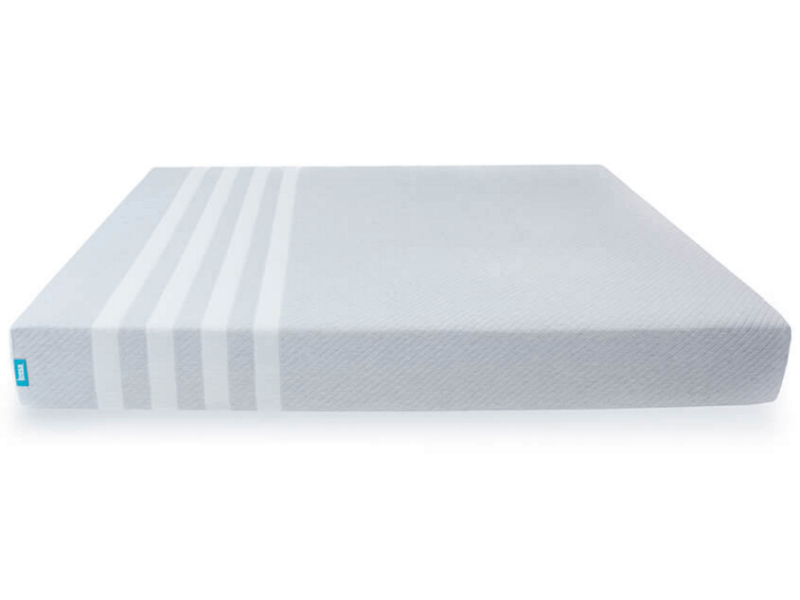 This adds even more durability and support to the entire structure, allowing it to provide a sufficient mattress core for sleepers of varying sizes without losing that initial, comfortable cushioning. 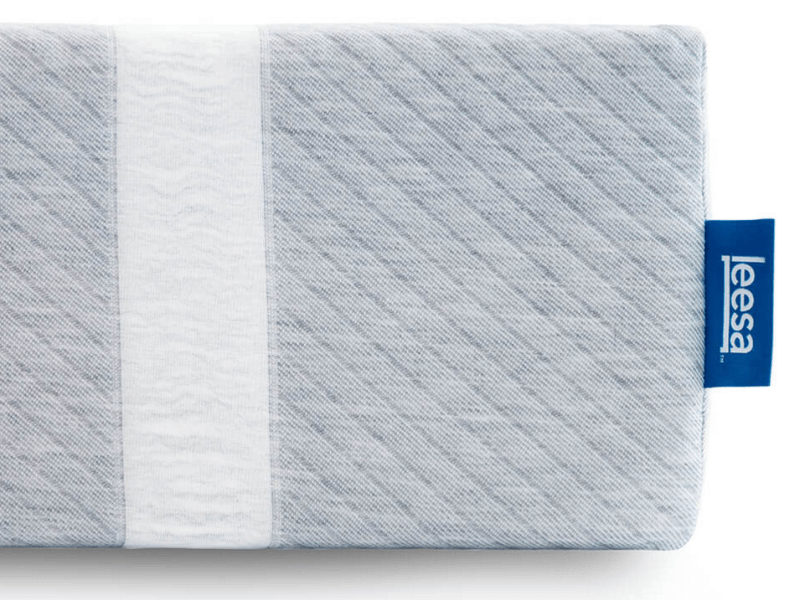 Together, the layers combine to give sleepers a full 10 inches of CertiPUR-US approved foam; kept together by two fabric covers. The inner sock consists of a proprietary blend of fibers, and is similar to the Avena top layer, in that it is naturally fire retardant. It is designed to interrupt combustion, smother flames, and prevent fire from reaching the foam—without chemical treatment. The actual mattress cover is made of a polyester and lycra blend, again with fire retardant features. It has an attractive and distinctive four-stripe design, and is cool and soft to the touch. We didn’t like that the cover is seamless and not intended to be washable; although this is by no means a rare specification, as most mattress manufacturers do recommend just spot cleaning. Worth noting that there is another mattress cover design available—called the Leesa ArtLifting Limited Edition—for an additional $50 tacked on to the price. Partial proceeds of sales of mattresses with this cover go to ArtLifting, an organization that helps talented artists that experience difficulties due to disabilities or homelessness. The Leesa mattress is available in six standard US mattress sizes: twin, twin XL, full, queen, king and California king. Unless your mattress size needs are very specific, Leesa’s offerings will be sufficient. Even with the mattress cover, the height of the mattress remains 10 inches. The weight of the Leesa mattress ranges from the twin’s 45 pounds to the California king’s 92 pounds; add five or six pounds for the box it comes in. Because of that thick bottom layer of support foam, there’s no need for a bouncy or forgiving structure underneath the mattress. Flexible slats on a bed frame can take away from the “universal adaptive feel” of the Leesa mattress, making it too soft; the same can be said for traditional box springs. For best results, it’s recommended that sleepers put the mattress on top of a firm, flat and solid surface. Modern box foundations and platform bed bases are great choices; another alternative is a slatted bed frame featuring sturdy, straight slats with up to three inches of space between. Usually a Leesa mattress is delivered to your door, and it’s up to you to get it into the house and inside the bedroom. Unboxing is helped by the box handles that make it easier for you to move it around. You can wait for up to 30 days before unboxing, but longer than that and it may have problems expanding properly. Once the mattress is unpacked and unwrapped—it comes rolled up very tightly and covered in plastic—it will start to expand very quickly. It’s a good idea to do this on the intended bed frame or foundation, so all you have to do is to slightly adjust the mattress to fit on the support structure once it’s fully unrolled. At this point, the Leesa mattress can be used but it’s a good idea to wait anywhere from a few hours to few days for it to expand fully and expel all odors contained and built up within the packaging during shipping. Some pro tips regarding the smell: It should dissipate fairly quickly; if it doesn’t, consider opening a window or two, or even moving the mattress to a spare space to allow it to off-gas there instead of your bedroom. The packaging the mattress came in—box and plastic—can also retain the smell, so clear them out of your room, too. The Leesa mattress supports sleepers weighing up to 300 pounds individually. This means that it can handle 300 pounds per side, and 600 pounds overall. Its touted “universal adaptive feel” is just another way to convey the “one mattress fits all” trend that most new mattress startups follow. This generally translates to comfortable medium firmness; though some customer reviews left on the Leesa website do complain about both excessive softness and firmness. That being said, the overwhelming response to Leesa’s approach has been positive. Worth mentioning here is that firmness—and by extension, a sleeper’s comfort level—is entirely subjective; however the fact that outliers exist, as uncommon as they are, seems to suggest that the “universal adaptive feel” is not as all-encompassing as the company would like to believe. Leesa doesn’t have the kind of reputation, name recall and acclaim that can only be gained by having been in the business for decades—like mattress manufacturing giants Leggett & Platt or Serta, for example, or even a smaller player like Nature’s Sleep—but so far the company has been nothing but professional. Leesa is a certified B Corp, which means that it’s been evaluated and found to have met high standards of accountability, environmental and social performance, and transparency. For every ten mattresses sold, one is donated to nonprofit organizations that serve the homeless. Currently, the number of donated mattresses is over 10,000 and counting. Leesa also has a partnership with the Arbor Day Foundation, which makes sure that one tree gets planted for every mattress sold. And while complaints about mattress firmness are uncommon already, complaints about Leesa customer service are truly rare. It might be a stretch to say this, but it does seems like Leesa makes an effort to help you sleep well at night—physically, emotionally and mentally. A Leesa mattress online purchase includes a 100-night free trial and free shipping. You are required to try out the mattress for at least 30 nights, after which you can take over two months more to decide whether you want to keep it or send it back for a refund. The return policy states that if you choose to do the latter, Leesa will pick up the mattress and then refund the purchase for free—unless you are from Alaska or Hawaii, where you’ll need to pay a $100 fee. It also comes with a 10-year limited warranty. 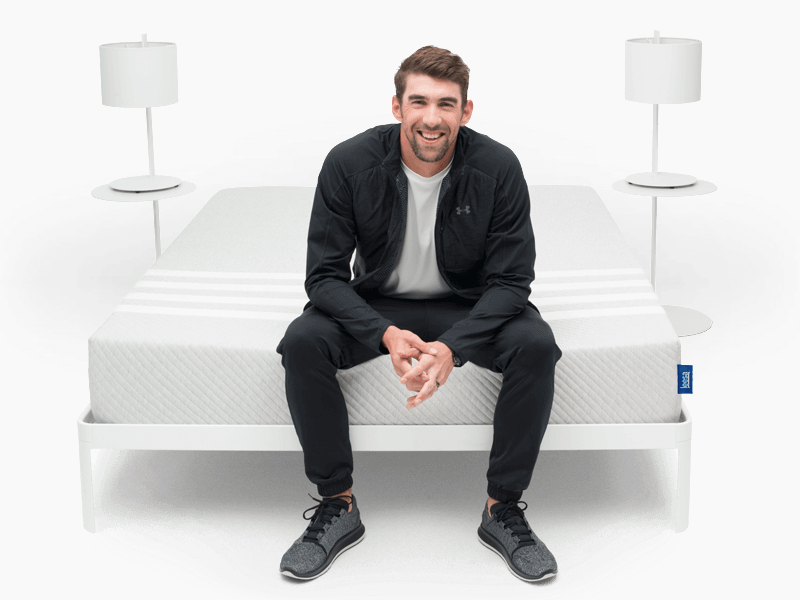 This requires you to use a compatible support structure with the mattress, but at the end of the day, it is a way to return a product that may be underperforming due to truly defective manufacturing. Why is this important? Since the company is so young, there is no anecdotal or laymen’s experience that can serve as evidence of the product’s estimated lifetime or any other durability guarantee related to the mattress. Without this proof, warranties are not an extra feature; they’re essential. Take note, too: Both free trial and warranty are voided if the mattress leaves Canada, the US or the UK. As of this writing, the queen-sized Leesa mattress is available for $940—less $100, therefore now $840, via a discount currently being automatically applied by the product website—and the estimated delivery time is between three to 10 business days. Recent laws in the States of California, Connecticut and Rhode Island also require retailers to add a $9 to $11 Mattress Recycle Fee at checkout; one per mattress sold, whether or not you are replacing an old mattress. More information on this at the Mattress Recycling Council’s official website. With only one physical showroom—it’s in New York—it’s almost impossible to test this mattress before buying it. However: The 100-night sleep trial, return policy, generous 10-year warranty, and great customer service more than make up for that difficulty. In fact, unless you are paying for a Mattress Recycling Fee or you are based in Alaska or Hawaii, there is virtually no monetary risk involved in purchasing a Leesa mattress. This, combined with the strong push for the product’s “universal adaptive feel” and the company’s wholesome and positive social partnerships, really make for a service and experience that is sensible as it is customer-centric. If you like the way the Leesa feels, you get the added benefit of knowing that you are also contributing to helping the homeless and making the environment better; and if you don’t, it’s easy to return. How about that?